Safely store your products with this Cambro 18SFSP148 18 qt. 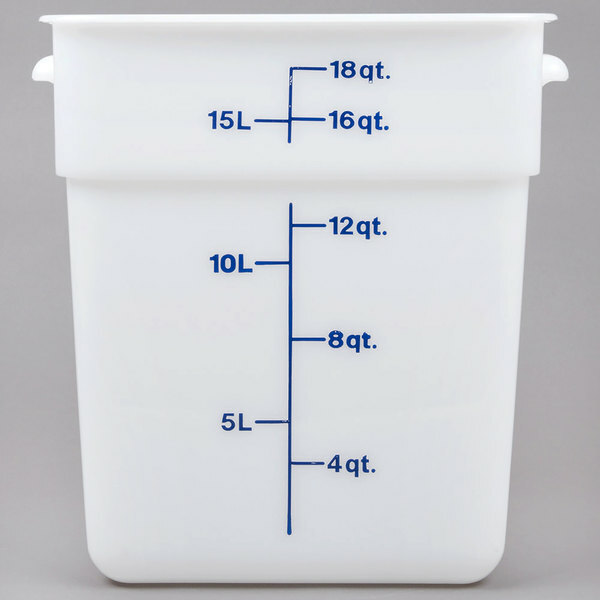 CamSquare® food storage container! Thanks to its square shape, this container provides 33% better space efficiency than typical round containers, allowing you to maximize your back-of-the-house storage areas. Its square corners also make it easier to pour liquids accurately without spilling a drop! This container can withstand temperatures from -40 to 160 degrees Fahrenheit, ensuring its safe use in both refrigerators and freezers. Plus, its interstacking design saves valuable space when the container is not being used. This food storage container is made of impact, stain, and chemical resistant white polyethylene that won't be stained or harmed by food acids, oils, and alcohol. Its 18 qt. 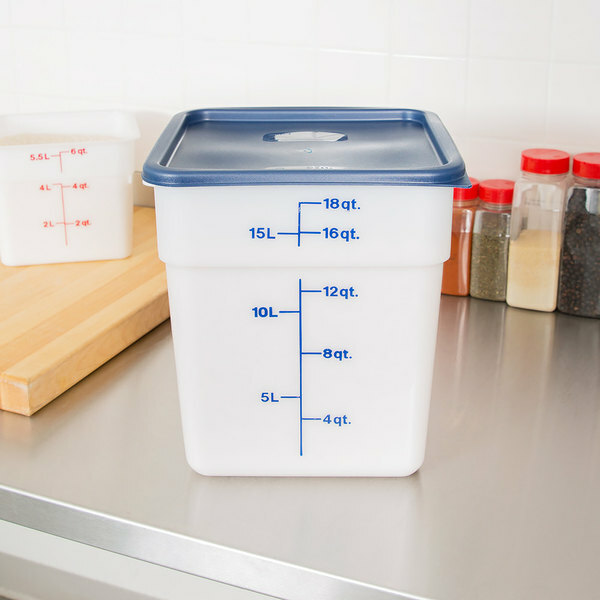 size is particularly suited for storing soups and stews, large volumes of thick sauces like marinara and BBQ, common ingredients like flour, or even batters for big breakfast restaurants and bakeries. Versatile in application, this CamSquare® is perfect for storing a variety of other common ingredients from vegetables to spices, cheeses, and much more! Plus, its easy-to-read midnight blue-colored gradations allow you to manage your inventory at a glance. To complete your food storage system and ensure optimal freshness of your goods, pair this storage container with a compatible blue lid (sold separately). Using the proper, tight-fitting lid is vital to keeping your foods fresher, longer. By completely enclosing your products, you can reduce the risk of cross contamination while preserving the fresh flavors that your patrons expect. Its distinct green color is also perfect for creating a color coded storage system. These are good quality - lightweight but still pretty heavy duty. Fit and finish is good and the handles are comfortable. I love that they are made in the USA! Can't say enough about Cambro products. Our restaurant uses the 18 qt CamSquare containers for large batches of sauces, such as our pizza sauce. They take up less space, come totally clean, and hold up well in our busy pizza area. 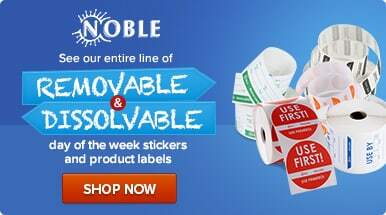 Highly recommended product. We love these durable and rugged containers. We use them for flour and other dry goods, as well as for brine and soups. They are very versatile and the markings on the side are very easy to read for measuring purposes. We use these for food prep storage and they are easy to ready and easy to clean. They cost 30% more at our local restaurant supply place. These cambros are a great price and perfect for our restaurant needs. The quality is great and is great for food storage. Purchased with the lids and could not find a better price! I usually get the less expensive no-name brand sold here, but decided to give this Cambro a try. However, I was hoping to use the clear tight fitting lid with this container but those lids only fit the clear Cambros and not these white ones. Comparing these to the slightly less expensive no-name brand, I don't see all too much different. I love the Cambro 18SFSP148 18 Qt. White Square Poly Food Storage Container with Midnight Blue-Colored Gradations! It holds plenty of product and keeps your product fresh! Great for storage. Very good quality and keeps mixes and batters fresh for days! We own several of these and use them everyday. Highly recommend for bakeries! Works great, keeps food dry and away from bugs. Make sure to get the lid that is suggested with this otherwise you might have an issue were the lid measurements are EXACTLY the same but won't close. Love these storage containers. 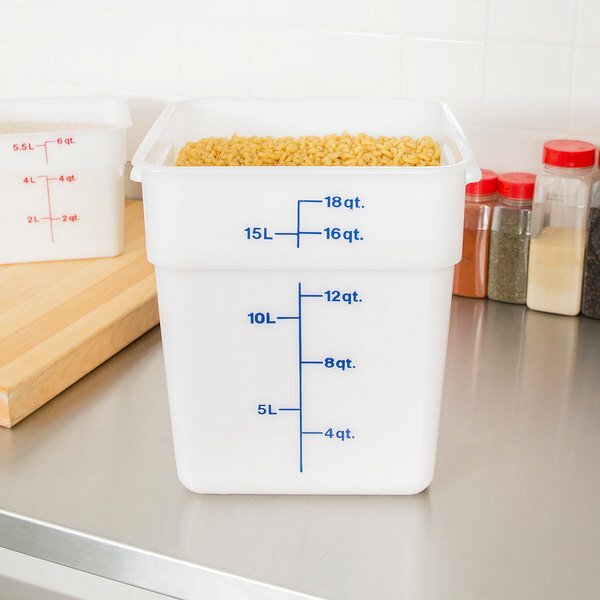 The size is great for storing bulk grains and for doing lots of different tasks in the kitchen. Square shape makes efficient use of shelf space. I have 7 of these containers and is in the process of ordering 6 more. I am so happy with these cambros. They are great for storing in the freezer and will not crack when it hits the ground. We use this product for our hand cut onions. They are durable, sturdy and do not break easily. I would recommend this to anyone who needs storage products. The Cambro 18 QT Square White Storage Container is great for storing our sauces like marina and BBQ. We have several of these in different sizes and stack them in the cooler. This is the best food storage containers made. 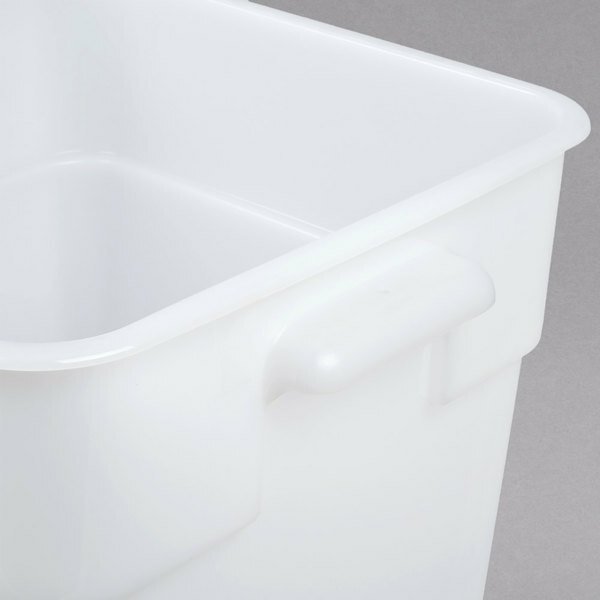 Cambro does an amazing job with high quality durable products that are easy to clean and do the job perfectly. I only use cambro for all of the storage products.